Much has been said about South Africa’s withdrawal from the International Criminal Court (ICC) and the risks of a “domino effect” or “mass exodus”. At least two other African countries – Burundi and The Gambia – have also announced their withdrawals. Experts have shed light on the complex legal implications, political motives and consequences on the ICC’s future. One problematic aspect of this debate is that it is highly emotional as the tone of many comments shows. There is widespread fear this might be the beginning of the end of the ICC and by extension the end of international criminal justice in Africa. But a broader legal perspective is needed. First, a little-known fact. Courts dealing with other aspects of international law have faced and handled temporary and permanent withdrawals. The International Court of Justice, which solves disputes between states, was little affected by the United States withdrawing to escape responsibility in a specific case against Nicaragua in the 1980s. The Inter-American Court of Human Rights continues to produce pioneer case-law. This is despite the fact that it has experienced withdrawals from two states frustrated by the court’s decisions against them – Trinidad and Tobago and Venezuela – numerous threats of withdrawals, and constant political difficulties. To a certain extent comparisons with the ICC’s current challenges could be made. It is important to recall that it is a court of last resort. It is the tip of the iceberg of international criminal justice that relies firstly on national jurisdictions. States themselves have the priority to prosecute and judge individuals for the most serious crimes – especially war crimes, crimes against humanity and genocide. The ICC’s role is therefore only “complementary”. Basically it intervenes only if national courts are unable or unwilling to do so. In addition, at an intermediate level between national courts and the ICC, there are also the less known hybrid courts combining national and international features to address specific situations. 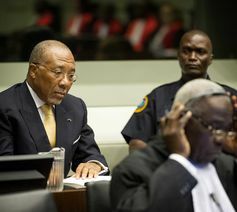 Former Liberian President Charles Taylor, left, on trial at the Special Court for Sierra Leone in The Hague. For example the Extraordinary Chambers in the Courts of Cambodia focuses on atrocities committed by the leaders of the Khmer Rouge. And the Special Court for Sierra Leonne sentenced Charles Taylor, former president of Liberia, for various counts of war crimes and crimes against humanity. Another example is the current project of the Special Criminal Court for the Central African Republic. The plan is to divide cases collaboratively between local courts, the hybrid court and the ICC. They all have a part to play as intertwined layers of international criminal justice. The more the merrier to fight impunity. In this context, the ICC crisis is still deeply problematic as it is the symbolic compass of the fight against impunity. But this does not have to be the twilight of international criminal justice in Africa. To draw a full picture, the current debate must consider the potential for strengthening regional alternatives in addition to national responses. What are the African alternatives? National responses can be improved by adopting appropriate laws where needed or creating specialised prosecution units. The financial and political challenges are always underlying issues, but there have been recent achievements at the national level. For instance, South African courts proved very responsive in the “Zimbabwe Torture Docket” case. Even if the crimes were committed beyond the national territory and without the involvement of nationals, their seriousness justified the South African courts exercising a form of universal jurisdiction, which is a powerful tool for states willing to engage in the fight against impunity. Hybrid courts can also be successfully developed in Africa. These courts have traditionally been backed up by the United Nations around the world. But there is currently a unique experiment happening in Africa: the Extraordinary African Chambers. This is the first example in the world of a hybrid court being supported by a regional organisation instead of the United Nations. The African Union is playing a pioneer role, proving that it can efficiently get involved in setting up such a court. Overcoming numerous challenges the court was set up in Senegal in 2012 to judge Hissène Habré, former president of Chad, for international crimes. Observers have concluded that the court has proved its capacity to ensure a trial respecting international standards of justice. Victims have also praised this long-awaited court finally offering a response to the crimes they suffered. In May 2016 the Court sentenced Hissène Habré to life in prison and the case is now at the appeal stage. The creation of an African Criminal Court could also be seriously envisioned. This is the project of the 2014 Malabo Protocol. Since 2008 there has been a plan to transform the African Court on Human and Peoples’ Rights, which has 30 Member States, into the African Court of Justice and Human Rights. The Malabo Protocol would extend the jurisdiction of this yet to be established court in order to include international crimes. It would be the first unified international court competent to judge general matters, violations of human rights (state responsibility) and international crimes (individual responsibility). This protocol presents various legal weaknesses, the main one being the granting of immunity to sitting heads of state and senior state officials. In practice this project also faces the common financial and political challenges of other international courts. So far the protocol has not been ratified. It is still unclear if the ICC withdrawals will translate into a revival of this alternative project. Finally, let’s not forget the long-term perspective. International criminal justice is a very recent field. It originated in the aftermath of the Second World War and came to the fore in the 1990s when the UN set up tribunals for the former Yugoslavia and Rwanda. The ICC itself is not even 15 years old. It is too early to know if the current crisis will be remembered as an earthquake, a critical turn or a hiccup in the history of the field. It is unsure how many of the current 34 African States Parties of the ICC will actually withdraw as they hold very different views. Even the formal notices of withdrawal might be reconsidered or later reversed if this crisis becomes an opportunity for opposing African states to get their concerns addressed from inside the Assembly of States Parties to the Rome Statute. Otherwise, from a legal perspective, it is preferable that discontented states use their legal option to withdraw instead of staying while violating their obligations to cooperate. And not all international obligations would vanish as all are members of the United Nations. Even states that are not party to the ICC have certain obligations to cooperate, especially in situations referred to the Court by the UN Security Council . The African Union has been vocal against the ICC. At the moment 54 of the continent’s 55 states are part of the AU. It will soon be 55 when Morocco rejoins after a 32-year absence. Now the AU has to prove it could lead a credible African alternative. There are legal options to explore if there is a genuine political will to do so. In any scenario, African leaders carry the responsibility to define the future of international criminal justice in Africa. African civil society also has a major role to play in taking ownership of this debate and keeping its leaders accountable.